Jennie J also known as Jennie Johnson originally from San Bernardino, CA has had a journey of a lifetime. Coming from a very broken home full of abuse to living in foster care a good portion of her life, to living in her own personal prison for years in a marriage full of emotional, physical and verbal abuse. Jennie has came a very long way in her time, rebuilt her life, and music is the one thing that never left her side and has been her lifeline. 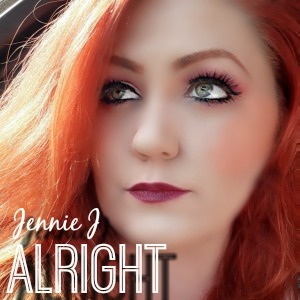 Jennie J writes in her latest single “Alright” about her life struggles as a child and as an adult. She expresses to us her story behind her father leaving at a very young age, her mother suffering from depression, alcoholism , and becoming abusive. Living with strangers in foster to her own broken home and marriage from domestic violence. Jennie had to become her own hero, saved her own life and learned to love herself when at times no one else would. It takes allot of self love and determination to get back up once you have hit the bottom and break the chain of abuse and she is on a mission to share her story and triumph with the world in hopes of helping even just one person heal and change the pattern of abuse and the outcome it has on your life.